Daylily Art Circus 2011:PROJECT 2 SUPPORT:WA WA PROJECT-Social Creative Platform for Opportunity-Know and support projects in eastern Japan ! 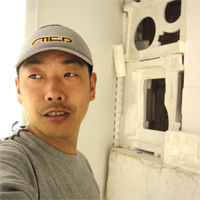 Primarily creating artwork which encourages audience participation, Yoshiaki has participated in "the 9th Venice Biennale International Architecture Exhibition" (2004), and "Echigo-Tsumari Art Triennial 2009". He is also known for initiating "Thank You Art Day" held on March 9. "Daylily Art Circus" is a traveling exhibition of artwork stored in a truck which moves across the Japanese Archipelago from the West to East. 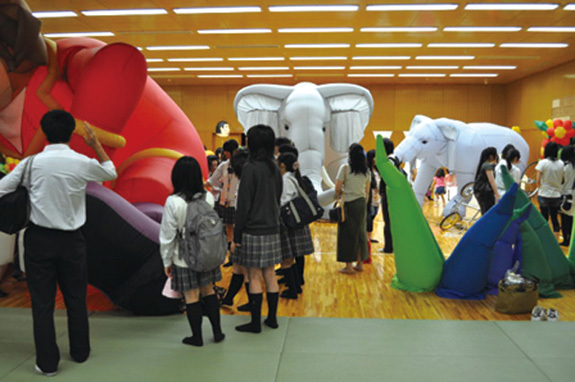 Fundraising activities were carried out in Western Japan and the Kanto area with all money being donated to disaster-struck areas of the Great East Japan Earthquake. The collection of monetary donations and materials from different communities is important, but in order to restore neighbourhoods hit by the disaster and Japan as a whole, it is also essential that the economy and cultural activities of Western Japan and the Kanto Area, as well as all communities throughout Japan, be revitalized. This project is being undertaken with the intention not simply of giving people the experience of an exhibition, but of making links between "points" in a "line" connecting Japan, and creating a sense of connection between the feelings of individuals and towns in these different localities.